PLEASE READ BEFORE GOING ANY FURTHER! I do not represent or work for any watch company. I do not know how to repair watches. I do not know where to obtain parts for watches. I do not appraise watches. I created this web page only to share what little I do know about Waltham watches. How can I contact the Waltham Watch Company? You can't contact them. The company went out of business in 1957. The FAQ you are reading was developed because people send me lots of questions about Waltham watches, but it is not officially associated with the company. Where can I get a Waltham watch repaired? I have received some recommendations from readers of this page, which can be seen at: Waltham Watch repair references. How can I get information about a particular Waltham watch? The following links may be of some help. 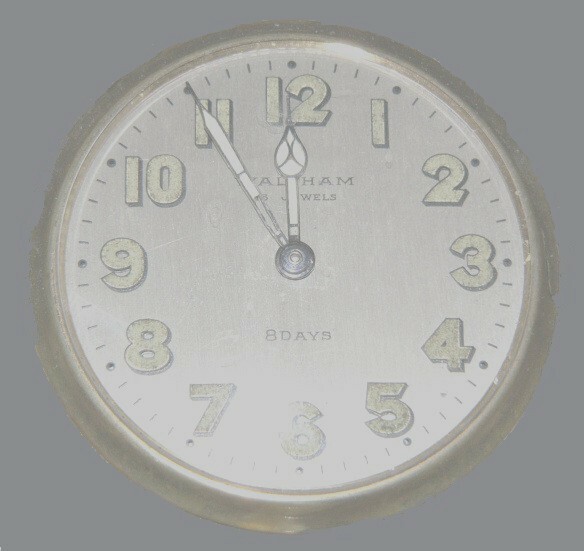 Waltham Watch date and serial number chart (oldwatch.com). When did Waltham Watch begin making watches? Aaron Dennison established Waltham Improvement Company (later to become Waltham Watch Company) in 1854. The factory became a major employer of Yankee Protestants offering higher wages and skilled work. In 100 years of existence the factory produced 40 million jeweled watches, plus clocks, speedometers, compasses, time fuses for bombs and other precision instruments. See key dates in Waltham history. Where can one go to see some Waltham watches? The Charles River Museum of Industry's top floor holds an expanding collection dedicated to the Waltham Watch Factory. The Henry Ford Museum & Greenfield Village in Dearborn, Michigan also has a display of the watches. Are there photographs of the factory? I don't have any historic photographs, but I do have photographs of the watch factory as it appeared in the 1990's. What innovation did Waltham Watch bring to watchmaking? The Waltham Watch factory pioneered the production of watches on an assembly line. When did Waltham Watch close? Were there any other Watch companies in Waltham? The Howard Watch Company also manufactured watches in Waltham. Copyright © 2014 by Scott Shurr. All rights reserved.